To mark the anniversary of Poland’s entry to the European Union (in 2004) , Flow gallery is linking up with Gallery Bielak, Krakow. 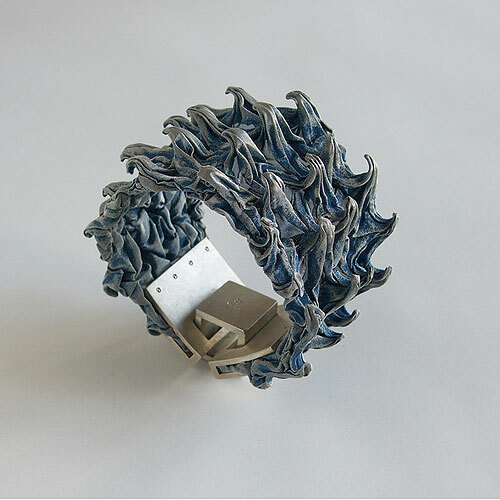 Director of Flow gallery, Yvonna Demczynska, has selected a group of British jewellers with the intention of representing a diverse hand of the most innovative makers on the contemporary scene. 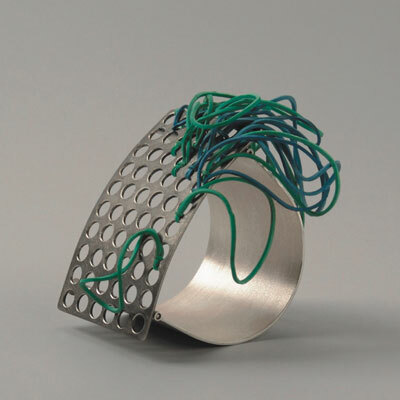 Running parallel to her endeavours, Andrzej Bielak, together with the Polish Association of Jewellery Artists, has picked out a body of work that effectively highlights the excellence in current Polish jewellery. Andrzej Bielak is at the fore of promoting Poland’s fine art jewellery, having co-founded the Association of Jewellery Artists. We will not be let down by his knowledge, passion or commitment. We particularly look forward to seeing his award winning work. 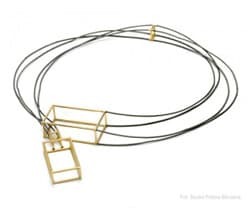 In drawing attention to some of the jewellers selected, let us look at Bohdan Jan Suchodolski. He has shown in solo and group shows internationally, where his precious materials combine with the more unorthodox. Also taking a mixed media approach are Antek Zaremski and Arkadiusz Wolski. Interestingly, Arkadiusz studied oceanography but set up his own jewellery workshop on graduation. He favours amber, but also employs metal to explore his ideas. Also changing tack in career post-university is Jacek Byczewski. 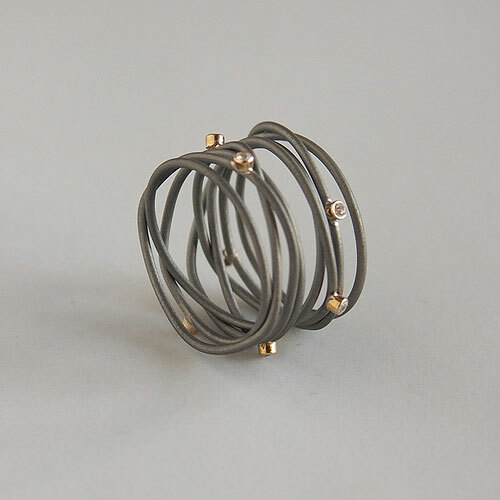 Having studied sculpture at the Acadamy of Fine Arts in Warsaw, Jacek became a jeweller. From this turning point in 1973 Jacek has gone on to berepresented at over 90 international exhibitions, with work in both public and private collections. Agnieszka Bruzda‘s executes her simple forms exclusively in metal, as does Mariusz Pajaczkowski. Mariusz lives and works in Warsaw, having co-founded the university gallery ‘Brama’. He uses a variety of precious metals. Jacek A. Rochacki descends from the well known artist/jeweller family. His distinguished career having seen him win multiple awards at the SILVER competitions in Legnica. The list of work coming to Flow Gallery is completed by that of Pawel Kaczynski, Bogumil Bytomski, Marcin Tyminski, Krzysztof Roszkiewicz, Krzysztof Piotrowski, Jan Wiszniewski, Maryla Maria Dubiel and Aleksandra i Jakub Wyganowscy. Jewellery travelling to Poland from Yoko Izawa, Alison Macleod, Katy Hackney, Kaz Robertson, Katie Murphy, Kayo Saito, Jane Adam, Hannah Lamb, Carla Edwards, Tanja Ufer, Katie Clarke, Angela O’Kelly and Laura Baxter. The trade between Flow Gallery and Gallery Bielak looks to be stimulating and thoughtful. It’s scope maybe necessarily defined, but it is hoped that the transfer of ideas will extend beyond that solely between Britain and Poland. STFZ co-organize top Polish exhibitions and competitions of artistic goldsmithing like « Revues of goldsmithing forms » of Legnica, and annual « Prezentacje » in Waszawa; formerly the artistic part of jewellery and watchmaking fairs « PAI TIME » in Warszawa and the « CAMELOT » of Kraków. The informative tool of STFZ is newsletter « INFO », edited 5 – 7 times per annum, and the www.stfz.art.pl web site. STFZ actively participate in international goldsmithing life cooperating with many goldsmithing associations, nets of contacts and by support to the www.klimt02.net.